This concave wall mural was painted as the last of 4 panels. It had to be a summer scene. 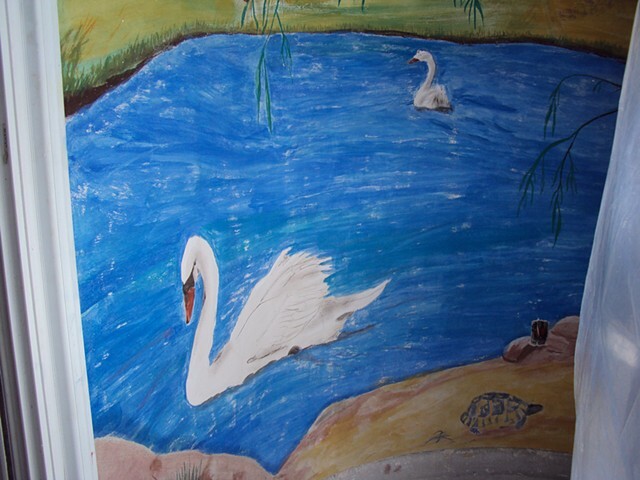 To symbolically connect it with the other 3 murals, I chose to use the swan. While painting it, the swan's symbolism of harmlessness was felt so predominantly in my process, I was truly both amazed and humbled. My hope is that the fresco will touch the hearts of its viewers in a similar way. My client asked me to add a turtle to the composition, just before I painted the last section of this all-weather buon fresco. The turtle too became very significant in reminding me and the mason of its symbol of patience.